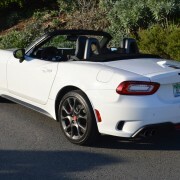 But along comes a Spider – a Fiat revision of the Miata called the Fiat 124 Spider Abarth. This numerical designation harks back to the lithe Fiat 124 that was sold in the 1970s and 1980s in North America during Fiat’s first ultimately unsuccessful tenure in the USA. 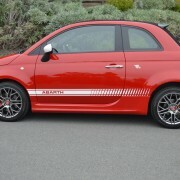 You cannot buy any car for $24,000 that will provide more driving entertainment than the Abarth tweaked Fiat 500. White laser stripes adorn both flanks as well, making the diminutive 2,450 package look more ferocious than cute. Based on its performance this scorpion has every right to look pugnacious. For the sheer joy of driving, Fiat’s 500 Abarth is unmatched. With a price under $30,000, it’s something of an economic miracle. Even though our bright “Celeste Blu” test car had its bottom line elevated by $5,375 worth of options, this storming gnat’s total price amounted to just $28,945. The L version of the Fiat 500 is a completely new offering for 2014. Although it shares many styling cues with the 500, like a snub nose and bobbed tail, the 500 is substantially larger, hence more practical as a family transport. Parking the L next to a standard 500 drove home the size difference in a way no set of statistics could. With the tails of both Fiats aligned, the L’s nose projects half a parking slot past that of the 500. Although Fiat introduced the Nuova 500 back in 2007, 2011 is the first time the cleverly styled mini-compact is coming to the US. And with its arrival Fiat makes its return to the American market. The Fiat 500 is so small and nimble that a pair of them could square dance in your living room. Rinaldo Rinolfi may just have something up his sleeve to make Fiat SpA’s partnership with Chrysler Group LLC work.